Jardine's Campfire Roasted Salsa is a unique, flavorful blend of fire-roasted tomatoes, Morita chile peppers, garlic and onions. Jardine's captures the best of the best in this wonderfully smoky salsa, and we believe you'll enjoy it as much as we do. 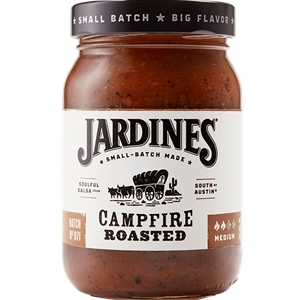 Jardine's Campfire Roasted Salsa is yours to enjoy as a full flavorful dip with chips, over eggs, rice, potatoes and fish. For a rich, savory sauce, combine 4 Tbsp of Campfire Roasted Salsa with 1 cup of heavy cream. Simmer until thickened and serve over grilled chicken, fish or pasta. 16oz. Tomatoes, roasted tomatoes, water, roasted onions, roasted garlic, salt, roasted Morita peppers, lemon concentrate, natural hickory flavoring.